The NTUVAS Animeworks is a subclub of the NTU Visual Arts Society, whose goal is to encourage greater awareness and appreciation for the arts here in Nanyang Technological University. The VAS has been in operation for more than a decade, and in addition to AnimeWorks, it also supports the Comics Ensemble and Designer’s Club under its wing. Animeworks works to promote and foster interest in animation, specifically Japanese Anime, among the NTU student population as well as supporting the local anime community. The club itself was originally established as the Japanese Animation Club in 1992. Over the years, we have organised many anime-related activities, from Hobby Kit Competitions, to Gundam Airbrushing courses, to Anime Fairs held in conjunction with the VAS’s Art Fiesta during which our club helps to sell anime related merchandise. 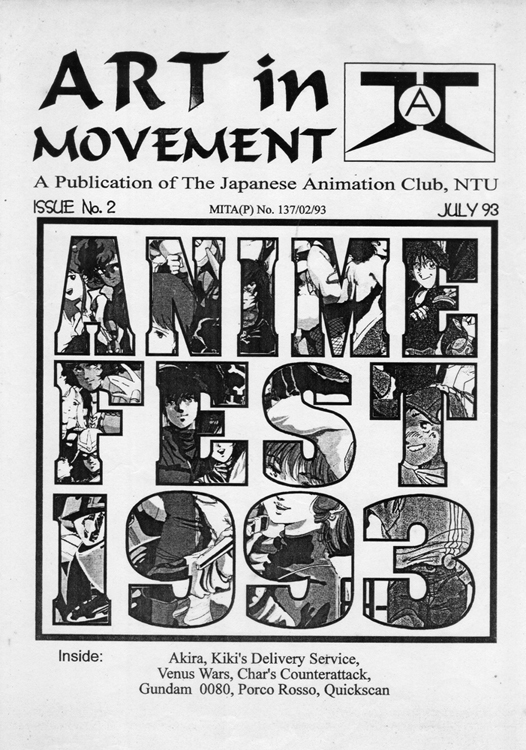 As the JAC, the club also produced print publications like “Anime Yoshi!” and “Art in Movement”, which helped spread anime related news and information to the student masses back in the days before the widespread use of the Internet. On the local front, we are also a regular supporter of the EOY (End of year) Cosplay event held every year among other events, including Animation Nation and the new Extravaganza illustration showcase held at Anime Festival Asia. The cover of the 2nd issue of "Art in Movement", the first JAC Publication. Our club’s mainstay event is the anime screenings we hold every year, be it back when people still used VHS, or using the modern media of today like DVDs. 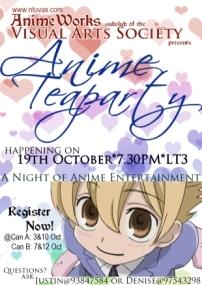 Despite adopting different names over the years, including Anime Fest, Anime Tea Party and more recently, Animation Revelation, the goal of the screenings remains the same; to expose people to the amazing posssiblities and worlds that animation can create, as well as providing an avenue for existing anime enthusiasts to meet and bond over their favourite anime classics. Of course, all of this would not be possible without the hard work put in by our dedicated members. For those who chose to join our Animeworks Subcommittee, you ‘d get to meet with people with similar interests on a regular basis and work towards a common goal, helping to form a strong sense of kinship and community among our members. So aside from just organising events, our members can always find Animeworks a place to just hang out and build friendships through our common love of animation. We also encourage our members to initiate their own anime related projects, and we will do our best to support their efforts in any way possible. As our club moves on into the future, Animeworks hopes to aim for bigger and better things to help spread the word on animation, and seeks to cooperate and build stronger ties with other similar local clubs. We hope to see you join us as a member sometime soon! where are you guys located state?